I would like 1 2 3 4 5 6 7 8 9 of these bases. 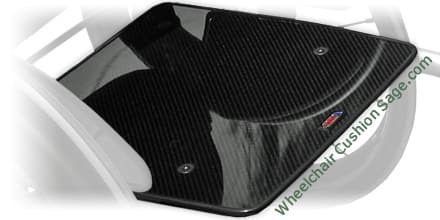 The ADI carbon fiber seat and composite solid seat base pans are rigid support alternatives to the more common fabric seat upholstery on which a wheelchair cushion rests. ADI - the manufacturer of this product - specifies these seat bases as follows. This manufacturer - ADI - lists the same weight, width, and load data (shown above) for both the carbon fiber and composite seat bases. * Fractional sizes are available at no extra cost — just send an email with your size. Note that ADI takes your specified width dimension - the distance between the outer edges of your wheelchair's left and right seat frame tubes - and subtracts half an inch to make the width of the ordered ADI seat base. For example, specifying a 16 x 16 inch size will result in ADI seat base dimensions of 15.5 x 16 inches. The half inch width reduction ensures that the seat base width does not interfere with other wheelchair components. When compared to the more common fabric-type seat base, a solid seat base increases the rigidity of a manual wheelchair's tubular structure. Additionally, one's sitting posture can; in some cases, be improved by changing a chair's seat base type from fabric to rigid. Note that the referenced postural improvement — an improvement due typically to eliminating the fabric's sling (i.e., the downward sag along the width of the seat base material) — may also be addressed by using a cushion that exhibits a sling-shaped bottom (commonly referred to as the sling option). Sling-bottomed cushions should not be used with these ADI seat bases. ADI's aluminum mounting hardware (shown as an option above) works with either the composite or the carbon fiber base. Technically speaking, ADI's carbon fiber (CF) seat base is a composite seat base. However, the wheelchair industry sometimes uses the term "composite" to differentiate a particular composite or composites from a similar carbon fiber product. In the case of the ADI seat bases, the ADI "composite" seat base is made of Garolite (sometimes called G10) which is a black-colored phenolic. The G10 composite base is a bit heavier and a bit less stiff than the CF base. If you hold an ADI CF seat base in one hand, and an ADI "composite" seat base of the same size in the other hand, the weight difference that you may feel is tiny. An ADI carbon fiber seat base - without the underside brackets - is noticeably more stiff than its "composite" counterpart - without the underside brackets. When the underside brackets are installed; however, the difference in the stiffness factor becomes essentially moot.